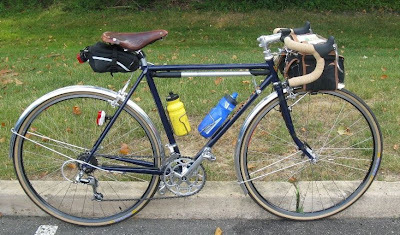 I put in 250 miles testing the bike with the combination of components I have laying around and some new parts before I decided in this final configuration. These photos were taken while I was riding a 600K brevet in NJ, "The Cranbury 600K." I am very impressed on how this bike rides, it turned out to be a fast and comfortable bike. It also climbs very well too which surprised me. So far in three week, a total of 640 miles and I am very happy with this bike. 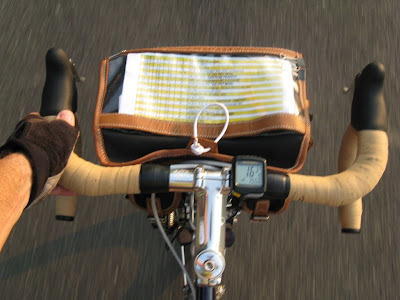 A lot of the cyclist riding with me in the brevet where very impressed with the looks and especially the frame, fenders, rack and bag. We see a lot of folks building up frames which obviously don't fit them well. I think most of these folks know that the frames in question aren't right for them. But usually they explain that it was such a great deal they couldn't turn it down, or they can't afford a new frame. Sorry, but even a cheap production frame that fits well is always better than the best hand-built masterpiece that's too small or too big. The vast majority of frames should have stems between 80mm and 110mm We don't even sell 130mm or 140mm stems. If you need a stem that long your top tube is too short. 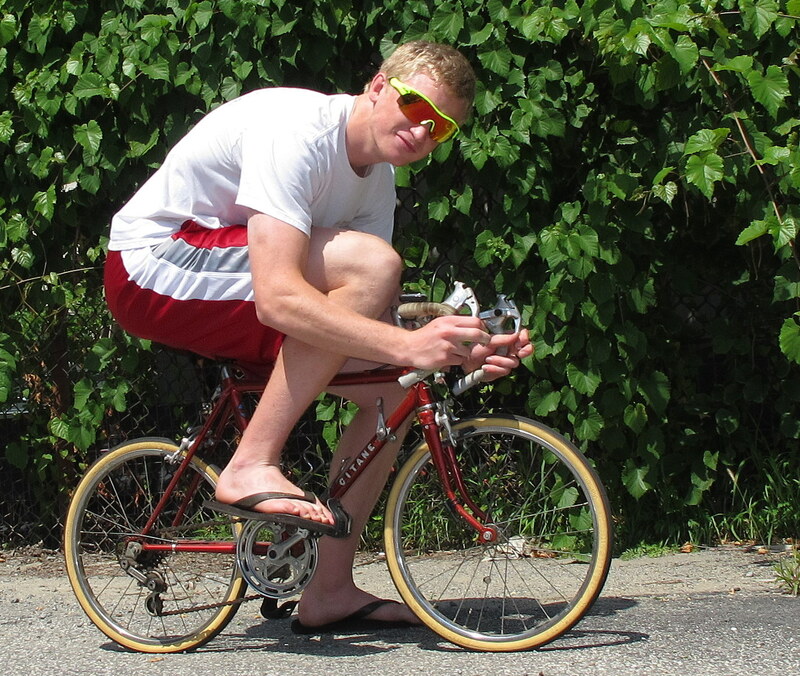 By using a super-long stem you are also putting too much weight forward and compromising the bikes handling. 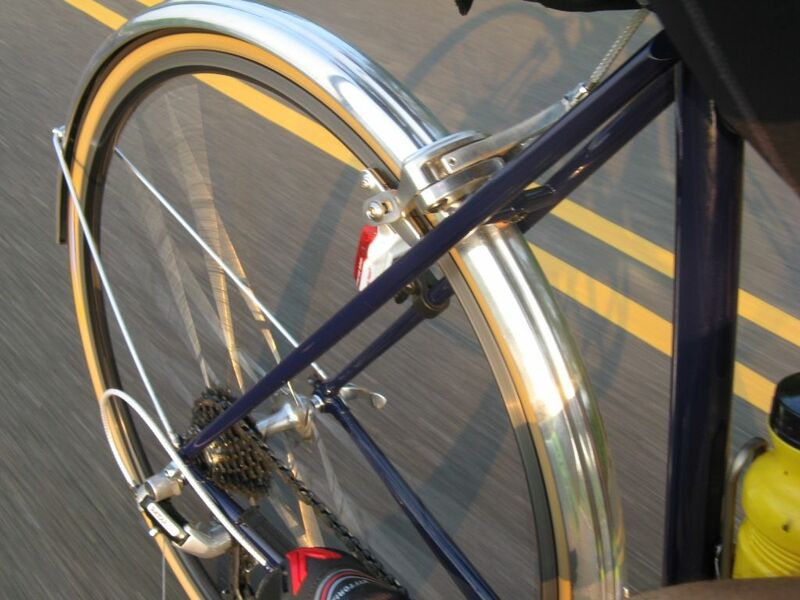 Very short stems may be useful on city bikes, but even those are a compromise. 15 to 30mm of seat post setback is all anyone should ever require, even with a Brooks saddle. 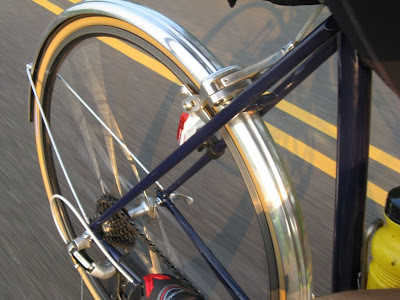 Needing more means that either the top tube is too short or, more likely, the seat tube angle is too steep. There are those folks who convince themselves that having their seat way behind the BB allows them to apply more power. But that sort of turns your bike into a semi-recumbent. You end up loosing the ability to spin. 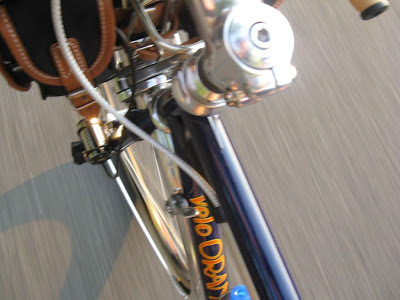 An extra-long seat post on a conventional level-top-tube frame indicates a seat tube that's too short. I'm still in the "fist-full of post" school of fit. Of course there are a few folks with disproportionately long or short, torsos, arms, or legs. And they often require custom frames for a proper fit. But most of us will find enough choices among the better production frames if we don't want a custom; there's no reason for an ill-fitting ride. I'll post my simplified frame fit guidelines soon. But for know I just want to emphasize that fit is more important than any other characteristic in a frame. I don't care how famous the builder is, how special the tubing, how beautiful the lugs. If it doesn't fit you well then it's not worth riding. You might want to have a look at the VO Specials page. There are some spectacular deals there right now. Since we're still hoping to have the new website up in a few weeks I wanted to get our inventory cleaned up. So we've been going through the warehouse looking for items that we have over-ordered. There are also some products that will change slightly with the next shipment and we're blowing out the old versions. And there are some items that we won't stock in the future. All these are on sale while they last, or until the inventory levels get back to normal. I do read all the ratings we get, but I've never looked at the numbers. Not too bad. 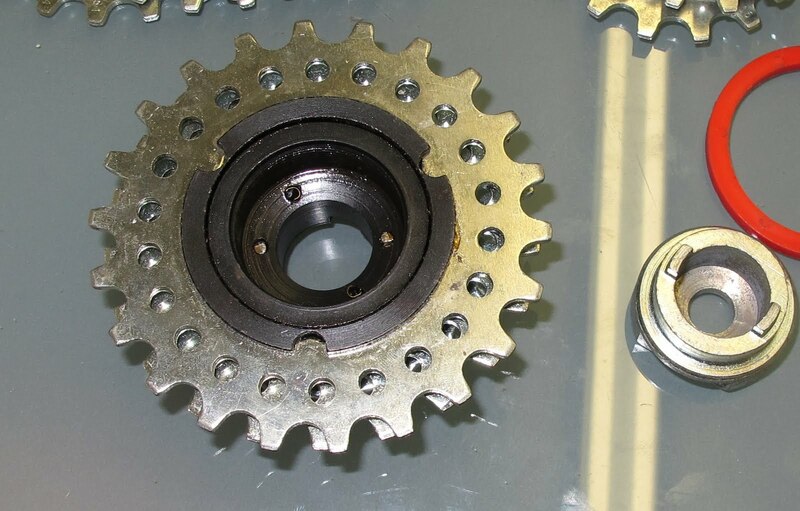 Since we'll be getting our VO Freewheel hubs in a month or two, I've been thinking about multi-speed freewheels. I still don't think VO will make freewheels, but I'm at least exploring remote possibilities. 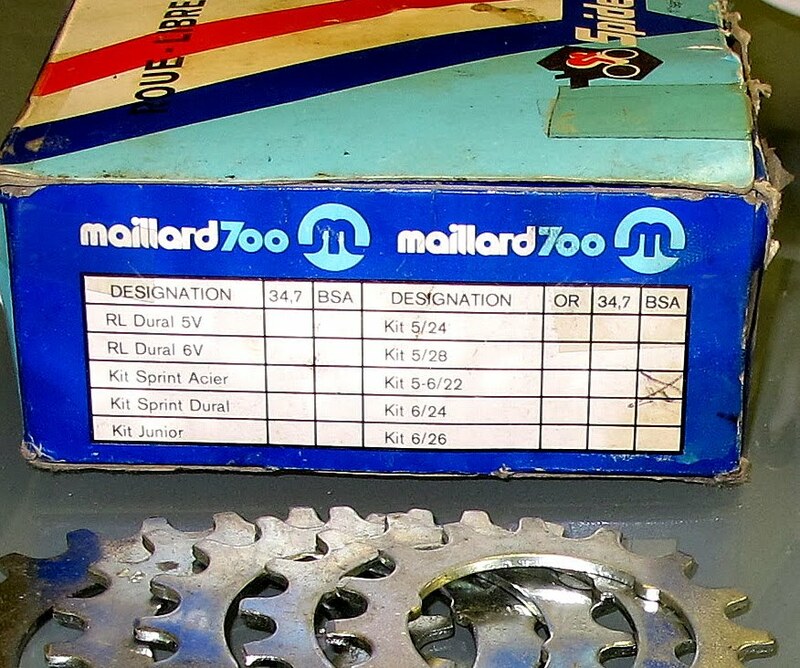 So I dug around in the bins of unusual old parts that we keep for inspiration and found this new-old-stock Maillard 700 "Professional Team Issue" freewheel system. It consists of a BSA-sized freewheel body and a range of cogs (from 13t-22t plus replacements) that can be built up as a 5 or 6 speed freewheel. There is even a removal tool and spare spacer included. I'd forgotten I had this and looking at it again I'm impressed by the idea. 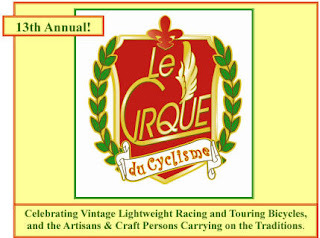 You could set up your cogs for each race or route, a straight block for a flat criterium or 13-22 for a hilly road race. This is the only example of a kit like this that I've seen, but apparently there were five versions available. Note that three were Dural, which is one of the earliest types of age-hardenable aluminium alloys. Those might have been pretty expensive when new. My kit is "acier" or steel alloy. 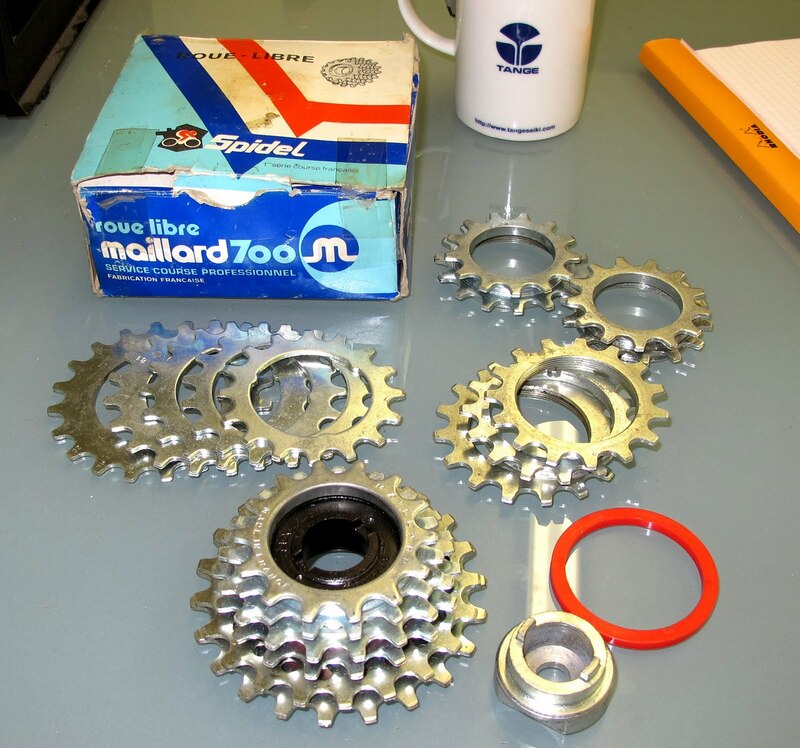 If we do manage to find a factory that can make freewheels to our quality standards, we may attempt a kit like this one. But making really good freewheels is hard. I remember the problems when we sold Soma's IRD freewheels. 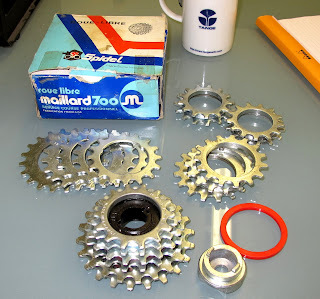 So we might all be better off sticking to Shimano freewheels or looking for the better versions of the old Suntour and European units. Frankly, there is no good reason to use freewheels over cassettes on new bikes, other than a certain retro-cool factor. But they are needed to keep all those great older frames original and on the road. By the way, if any of you collectors want this kit, shoot me an offer. I don't think I'll ever use it. I'm very impressed with Spanninga's latest lights. Since their acquisition of JOS and Hella, this Dutch company has been continually introducing new products and technologies. The most interesting is their "Reverse-Beam Technology". They claim it's one of the most efficient LED systems available. The LED bulb is mounted just behind the lens and aimed rearward at a mirror that focuses and reflects the light. This minimizes light loss and gives a strong focused and lateral beam. We just received a shipment of lights from from this Dutch manufacturer and two of the new models incorporating this system. The other Spanninga trend is that the new models are generally much lighter and smaller than the previous, while putting out more light. 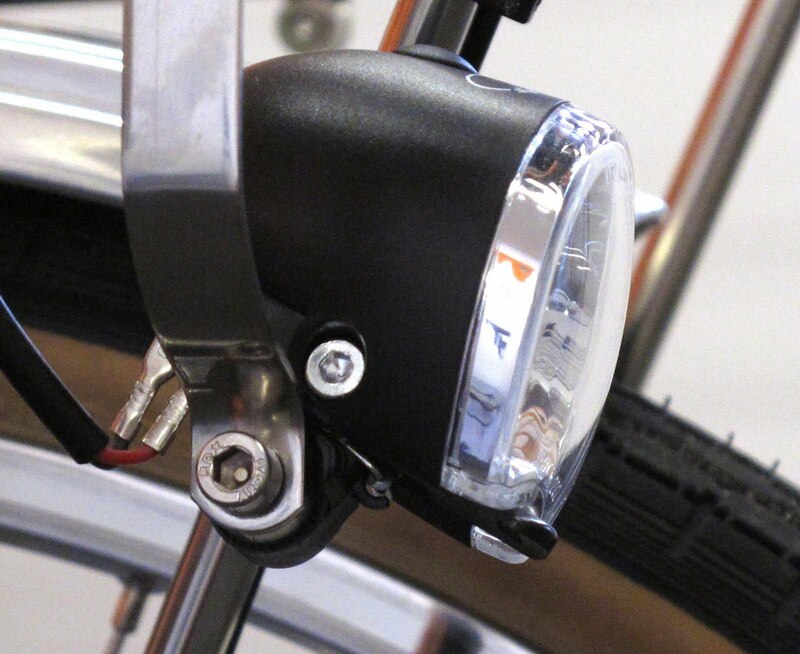 The first is the long awaited LED version of the Micro FF dynamo light. 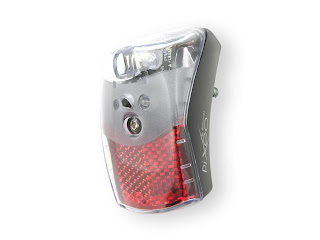 This light also has a safe stop feature that keeps the light on for about 4.5 minutes after you stop pedaling, very useful at traffic lights and stop signs. But what's most amazing, other than the brightness, is how tiny and lightweight (54g) this light is. Though the Micro FF comes with a bracket and reflector, we usually remove them and use a VO light bracket to mount it on the front rack. This results in a lightweight and very compact, but powerful, headlight. 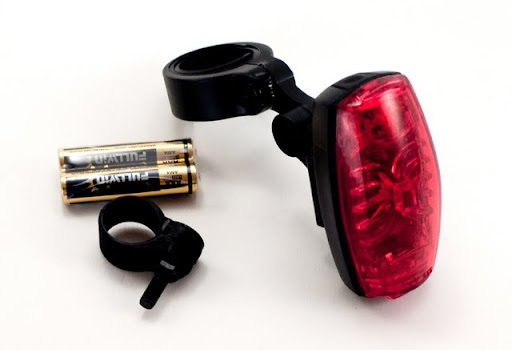 The other new light with reverse beam technology is the Mega LED battery light. Again, this is a compact, light and very very bright unit. 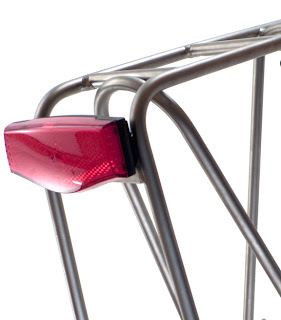 The new rack mounted Plateo LED lights are available in dynamo and battery versions. The Plateo has a very bright steady light (not flashing) that can be activated automatically when it gets dark or turned on/off with the switch. It's very thin (22.4mm for the battery versions) and also very light (65g for the battery versions – incl. batteries). The dynamo version is even thinner and lighter. The mounting system allows it to be used on brackets with standard 50mm spaced holes (common in the USA) or on European racks with 80mm hole spacing. That dual spacing mounting is something we've been pushing for for years. There is also a new and (excuse the repetition) lighter, smaller, and brighter fender mounted taillight, the Pixeo. Again it has the safe stop feature. A battery powered version is due in a few weeks. Finally we have the new "Compact" taillight. 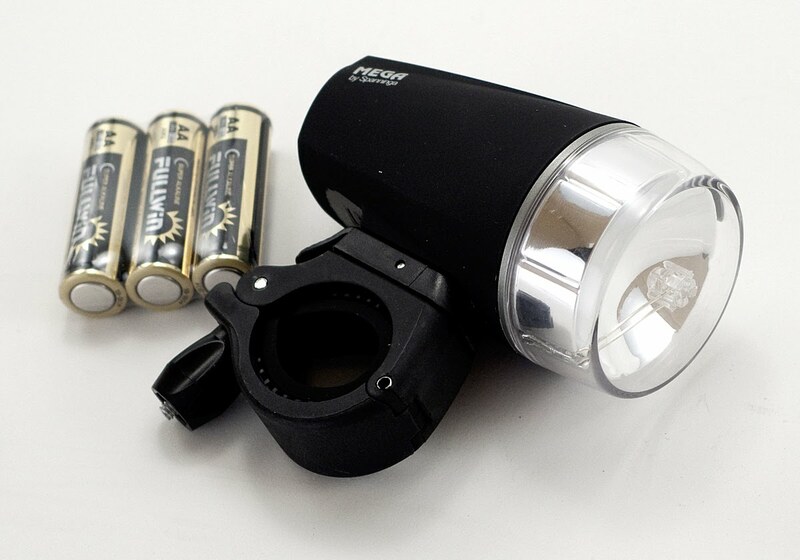 It uses two AAA batteries that last about 140 hours in steady mode or 600 hours in flashing mode. With the "Light-Guide Technology" (patented by Spanninga), the Compact Rear offers an optimal rear and lateral visibility (220° visibility) since the light is also visible from the sides. A Low-Battery-Indicator warns when the batteries need replacement. It's shock and water resistant. The housing is easy to open without any tools to replace the batteries. 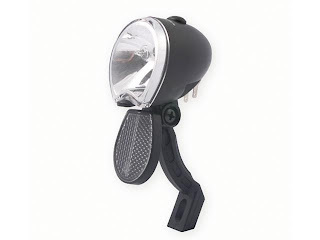 The Compact light offers various mounting options: it includes brackets to mount on a seat-posts or a seat-stay. It can also be clipped on a saddlebag or on your jersey pocket with the built-in clip. Not bad for $18. This is a reminder that the 13th annual Cirque du Cyclisme takes place this weekend in scenic Leesburg, VA. In addition to rides, seminars, and more cool bikes than you'll ever see in one place, there is the swap meet. VO will be there with lots of seconds, prototypes, and overstock parts that have been taking up space in our warehouse.